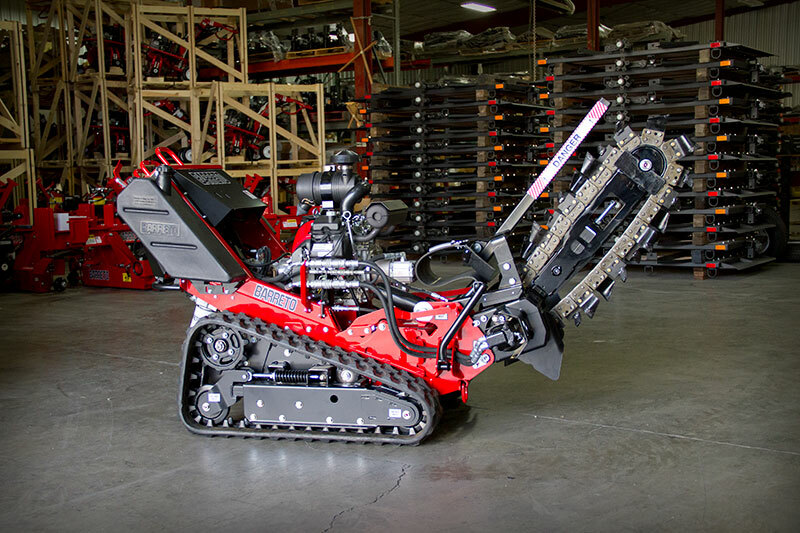 In order to provide you with the highest quality equipment, the greatest return on investment and the least amount of downtime, Barreto Manufacturing continues to expand your options with the new 2324TK Track Trencher. Track trench. In order to provide you with the highest quality equipment, the greatest return on investment and the least amount of downtime, Barreto Manufacturing continues to expand your options with the new 2324TK Track Trencher. Track trenchers are the answer to many of the challenges you face in trenching applications. Because of their large footprint, tracks are less invasive on the landscape. Cross-trenching is made simple and by combining tracks with additional weight, the ability to keep the trench straight is greatly improved. 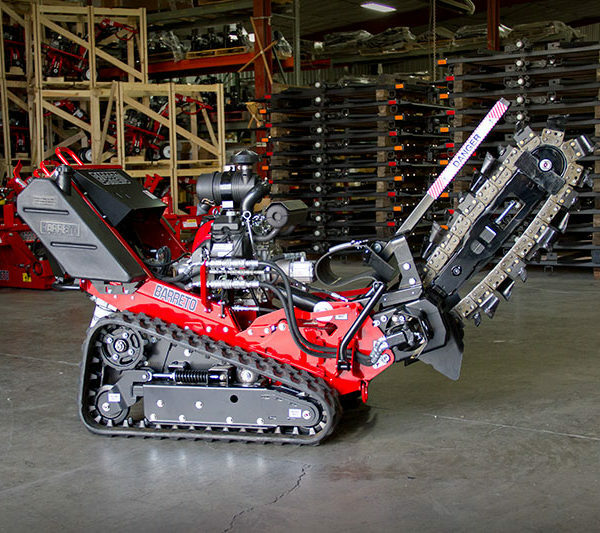 The 2324TK features an ergonomic single handed control and up to 48 inch trenching depth. Please contact us at 1-800-525-7348. Barreto controls are, “set and go” type controls that do not require much attention once they are positioned. With the set and go cruise control, the operator has only to set the depth (counterbalance valve controlled), set the speed and hold in the safety clutch with one hand. The safety clutch cams into place, requiring very little pressure to hold against the handle grip. Because of the ease and simplicity of this design, he is allowed to sip on his cold drink with the other! You will often find that the operator using a Barreto, as opposed other trenchers, will be relaxed and have a smile on his or her face. With a 238 sq. in. footprint on the tracks, crossing trenches is made easy. There will not be anymore issues getting stuck while cross trenching. The Barreto track is wider, longer, and more aggressive than other walk behind track trenchers. With this size and design of track, the Barreto will not have any problems with traction. Maintaining the Barreto is made easier with its open design. All components are protected, yet conveniently accessible for maintenance. Available for the track trencher is the Barreto 4X6 tilt bed trailer. The trailer makes transporting the trencher safer and more convenient with the quick lock system. Total Ground Contact: 460 sq. in. 460 sq. in. 460 sq. in.